The 2nd stage of the Carnival of Wonders that is the boy's 10th birthday was the Treats for Class. I'm usually good for some pretty decent class treats, but this year's had to be a show-stopper because it's the last one. Ever. Next year he'll be starting that Carnival of Horrors that is Middle School. 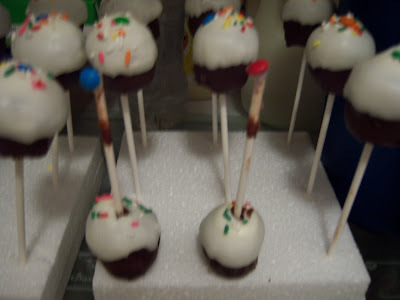 So, of course, the answer is Bakerella's Cupcake Pops - adorable, easy (if time-consuming) to make, easy to transport and serve and definitely a sure-fire way for the kid to win friends and influence people. Yep, the pop has slid down the stick, leaving the mini M&M perched at the top. I said, "Well, they must have been out of the fridge too long, let's pop 'em back in." 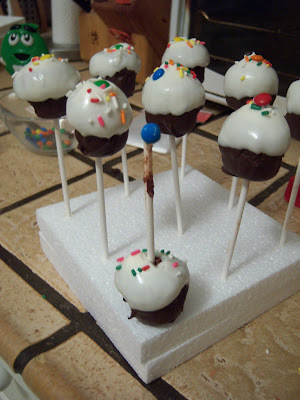 Yep, TWO had slid down and leaving their M&M toppers balancing like Pillippe Petit atop yon dizzy heights. I thought Max was going to bust a gut! Luckily, I've rescued far worse mishaps than thus (do I have to remind you about the Tempest in a Teacup?) and was able to save them with a little bit of Candy Melt and a little bit of love. I had visions of exploded cupcakes a la The Balloon Incident. Sliding toppers or not, these look delicious! Speaking of birthdays, did you realize we have the same one sans five years difference? Go March 12!